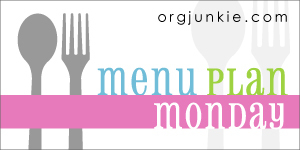 Menu Plan Monday: We have to eat! I might be a day behind and new at starting this but here it goes. Since I figure that I’m planning my meals and we always eat every week anyway it really isn’t a stretch to do the Menu Plan Monday. Monday: Chicken Noodle soup- I had no recipe, I kinda threw together what sounded good. Very professional I know. Thursday: Chicken Pita- On our way home from Blissdom on Sunday we stopped at this SUPER cute restaurant called Sky Blue Cafe. We all wanted to try everything on the menu but decided the clever thing to do was to check out their menu and try to recreate the dishes. It’s time for some Valentine’s Day sweetness in your kiddos or sweeties lunch. These lunches are so cute that it might even earn you an extra hug or kiss. I like how this super simple and cute heart sandwich is the fun of a thumbprint cookie in a sandwich. All it takes is a cookie cutter and some fun sprinkles on a standard peanut butter and jelly. Who doesn’t love to receive a love letter? You can make a simple love letter sandwich with only 3 pieces of bread and a rolling pin. For the heart shape “seal” one the letter you can use even a heart sticker if you don’t have anything else heart shaped foodwise. 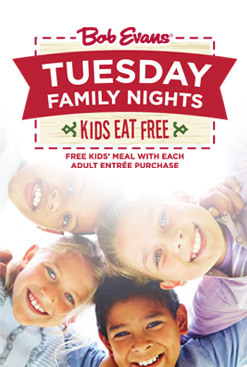 Kids Eat FREE Every Tuesday Night at Bob Evans with an adult entree purchase. Valid for children 12 and under. Family Night takes place weekly from 4PM to close. Let them help you bring the whole family together this winter for a good meal and activities! Also be sure to visit them on Facebook to download your Sweet Treat Club Card to earn FREE cookies & an Ice Cream Sundae for your kids! Want more deals like this? Be sure to check out our great list of KIDS EAT FREE for daily deals. If the public schools are closed for a snow day bring your kids into O’Charley’s for a FREE kids meal with every adult entree purchased. So when there’s snow.. don’t worry.. because there might be free food in your future! Here’s the fine print: Available in participating restaurants in Ohio. Offer valid in restaurant location of the local school system only. Free kids meal is valid for children ages 10 and under. Available in restaurant only. It’s now 2 days after Halloween.. you’ve had a day to feast on your candy.. but what do you do now with ALL THAT CANDY? Well, here are a few options that you get something better in return. Earth Fare- Trick Or Trade-In: From Nov 1-5 you can trade in your candy for healthier options. Noodles & Company- Candy Coma: On November 6 from 11am-close bring in a pound of candy in exchange for a free bowl of noodles. Halloween Candy Buyback: There are a couple dentist offices in the area that participate in a Candy Buy Back and the candy gets sent to the troops. You can read details on their site, plus find participating locations. Just be sure to check with each location for all the details of their event. If you know of any other places that have a Halloween Candy Program please let us know and we will add it to our list!